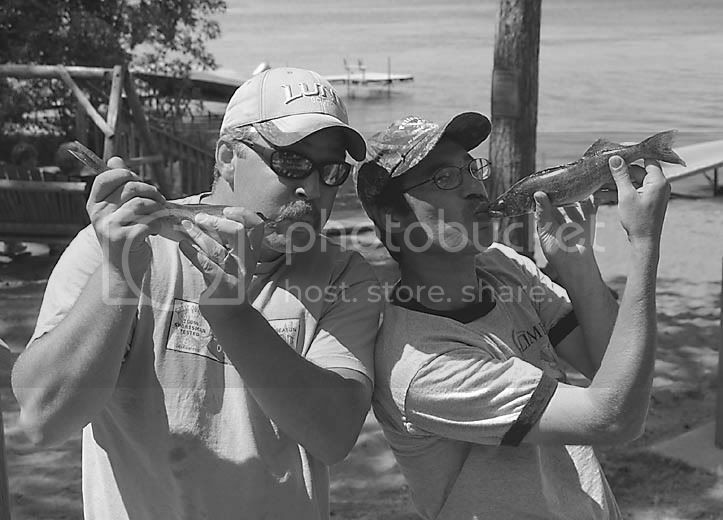 The pic from BSL walleye tournement - - - 6 messages. Showing 1 through 6. We got beat up in the 4' waves to get these 2 monsters.We caught the most too! My only comment on the way in was do we have to show them? I was embarressed ,but hey it was BSL in very hot water & high pressure. Wouldn't that be a hoot. 2 stockers & they brought 600$ to our pockets. As small as they were,we worked hard in rollers to get them.Being SandBurr had his hands full operating the boat keeping us on the fish,it became my job to catch those monsters. SB got half the winnings plus he got Mean Genes autograph. If you ask me he wanted the autograph more than the 50 buck$.We could have saved ourselves the struggle & just sat in the bar for that. I've got to say that SB knows his stuff.Anyone to fish with him is lucky to have spent the time with him. SB is tops on my list of fishing guys. All hail the mighty SandBurr!!! no ,they are very small & normally I'd toss them back ,but it was a contest & BSL is known for small eyes.I certainly did not think that they would win it for us. I will keep an eye to eat if it is between 15"&20"everything else goes back.